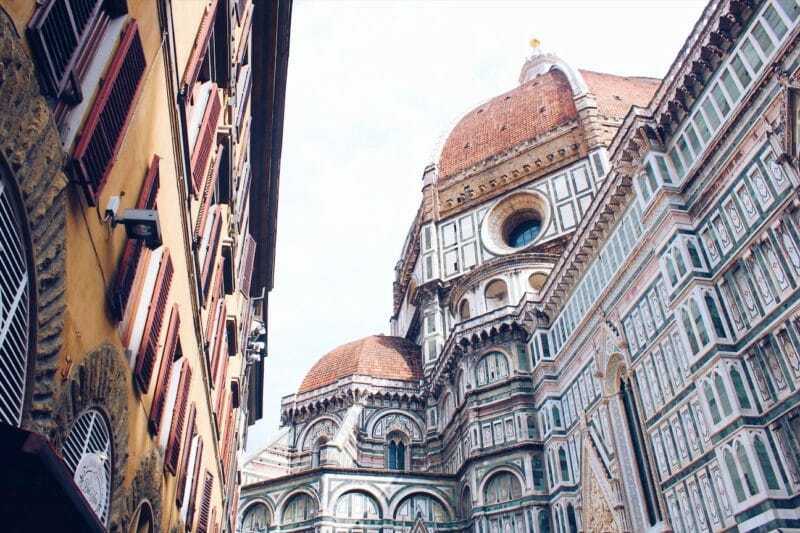 The towering red roofed dome of the famous Florence cathedral is what makes the city recognisable, and the cathedral itself, the square in which it sits along with other religious architecture and many cafes and shops is the most visited area of Florence. 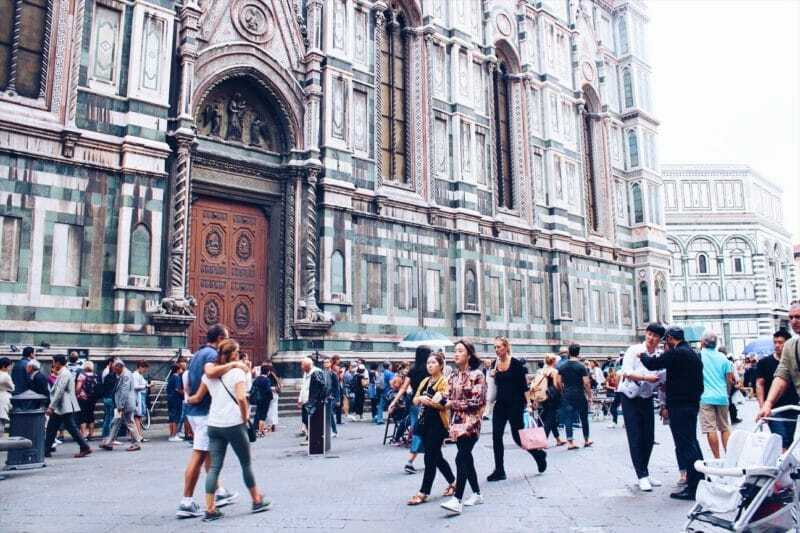 Right in the historical centre of the city, Piazza del Duomo is unmissable, and here’s what you can expect from a visit there. Like any famous European city, steeped in history and renaissance art the visitors flock to see it, so it is pretty busy, but I have to say it didn’t feel claustrophobic or too bad. Due to the size of it there is plenty space, even with the cafe tables spilling out into the square, and the huge queue for the cathedral that snakes its way around. 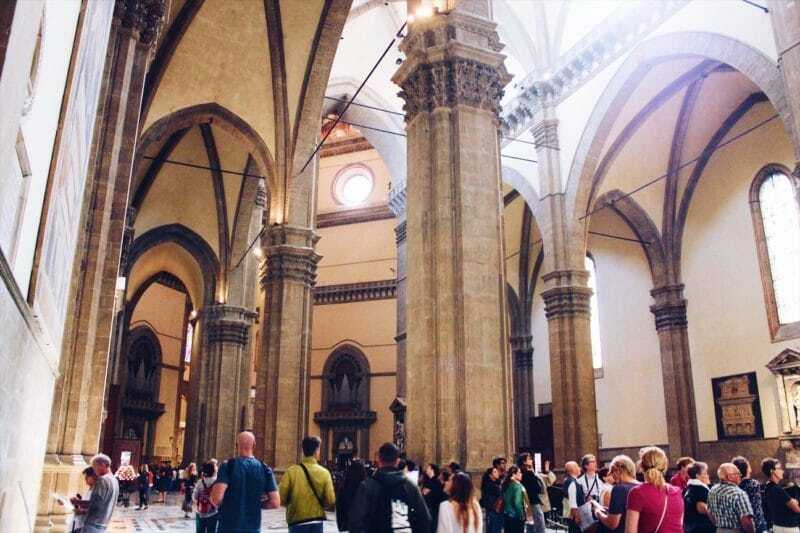 It’s a beautiful open space, with traditional Tuscan architecture surrounding it, and one that you’ll want to walk around a good few times to take it all in. 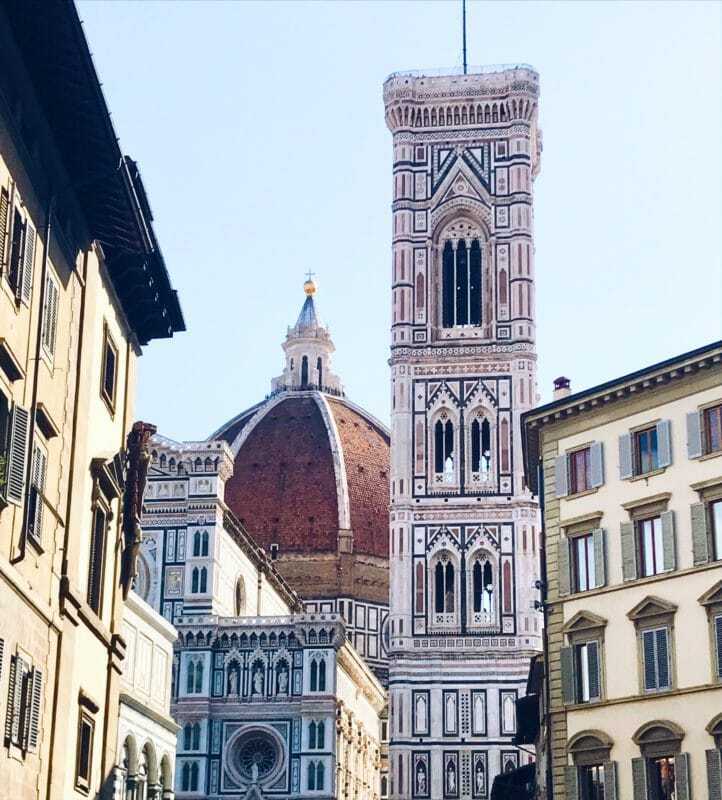 Santa Maria del Fiore Cathedral dates back to the 13th Century, and from wherever you see it whether it’s right up close from the Piazza, or from the Tuscan hills overlooking the city, it’s incredible. 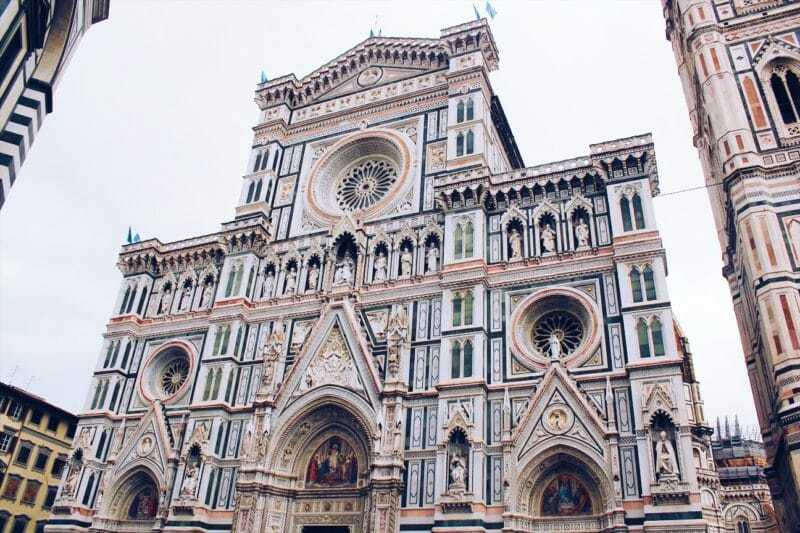 The cathedral itself has the intricate detail made from pink, green and white marble slabs, but on an enormous scale. 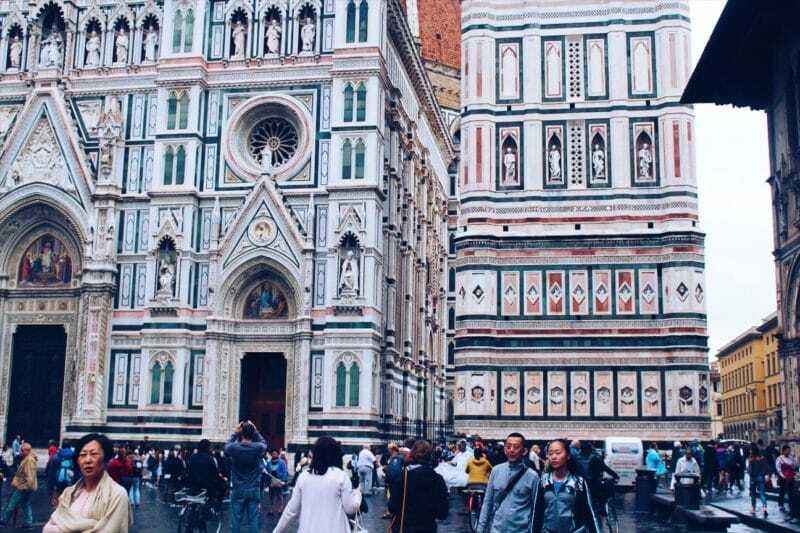 Then there’s the Duomo. 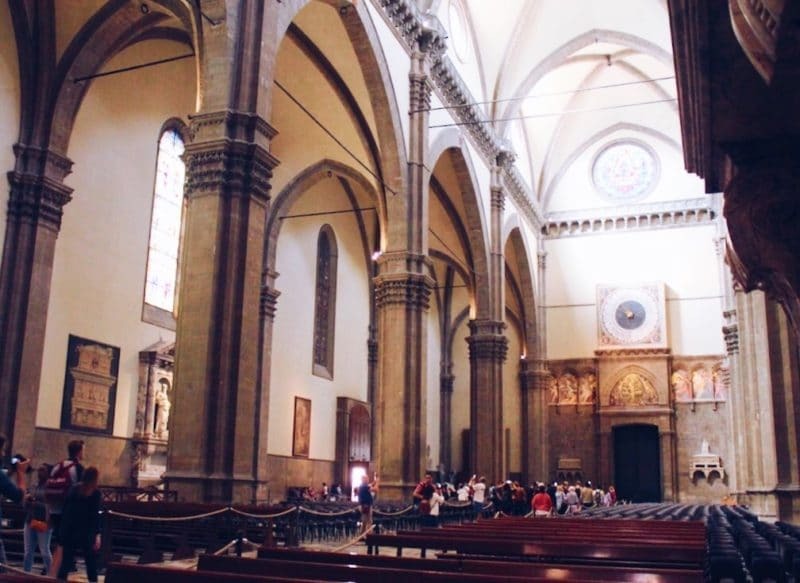 This iconic part of the cathedral was added later in the 15th Century, designed by Filippo Brunelleschi. You can climb to the top of all 463 steps to see what I’m told are unrivalled views of the city, but unfortunately on our visit we didn’t have time to do it. 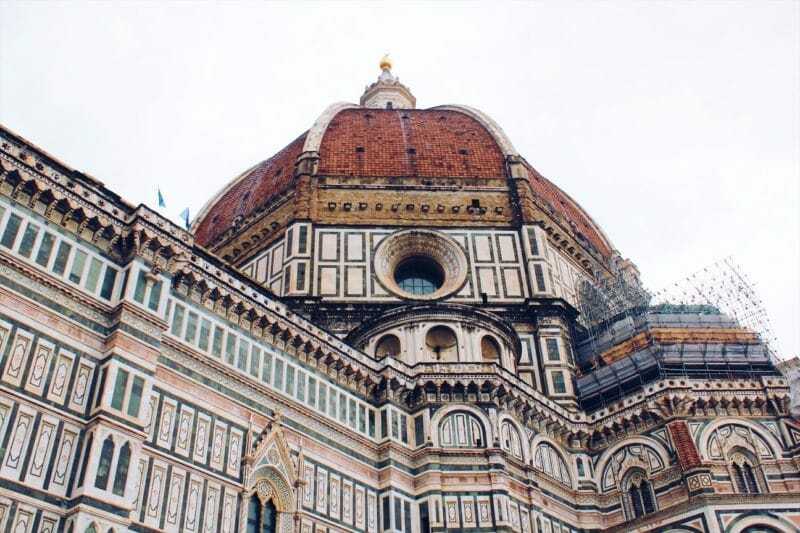 Tickets to climb the Duomo sell out weeks in advance so if you’re wanting to do it definitely plan ahead and book. 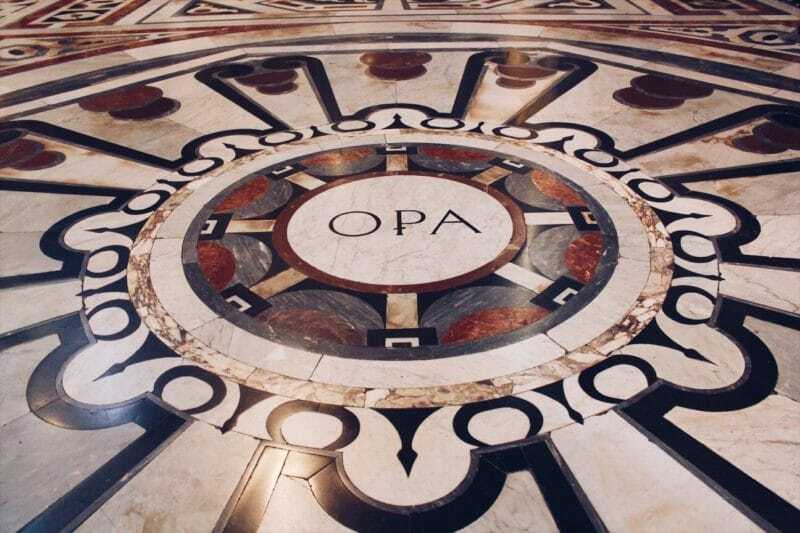 We discovered that you can get some last minute tickets on the day, as part of a bigger tour of the cathedral, the crypt beneath, the private roof terrace and the baptistery. 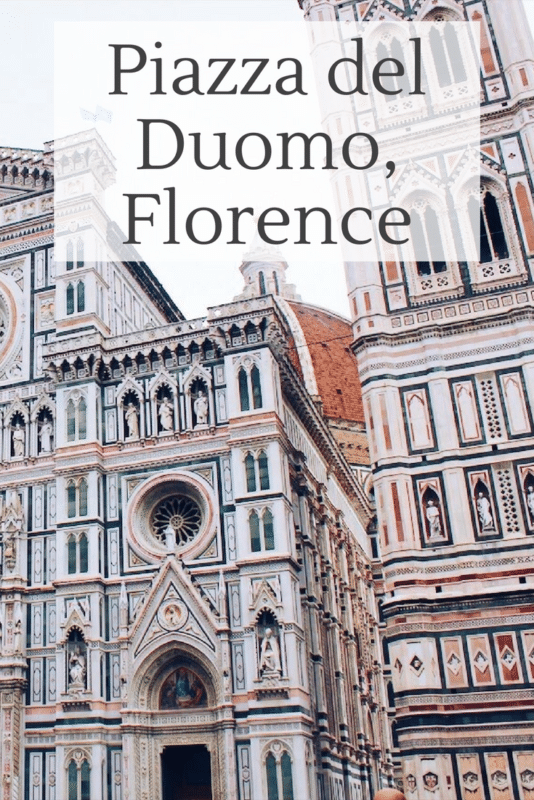 Again we just didn’t have time to do it, but if you find yourself without Duomo tickets and regret it, this option is a good one that will ensure you get up there. The guides stand outside the entrance to the cathedral itself, and patrol the queue to get inside. They’ll be wearing black with official T shirts and jackets on, and will take you to the tourist office to book so you know they’re legitimate. 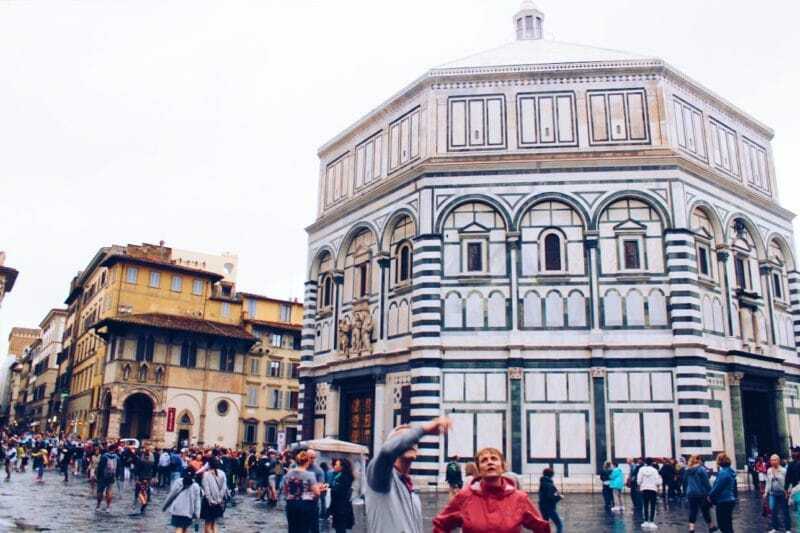 We visit the Piazza del Duomo numerous times over the few days we were in Florence, it’s great to get your sense of direction in tune and if you can see it then you’ll never get lost. On our last day we had some spare time so decided to go inside the cathedral. The queue is always big, but it actually moves pretty quickly. It’s free entry to get inside, but you can pay a small fee if you want a headphone set and audio guide. Staff encourage this to keep the noise down inside, but you can just go in to appreciate how amazing it is without doing a full tour. Inside the cathedral, I was surprised to find that aside from the intricately detailed tiled flooring, it’s actually quite simple. In total contrast to it’s exterior, it isn’t as decorative or ornamental as somewhere like Notre Dame or Sacre Couer. There’s a giant old sun clock above the entrance, but the main feature that will undoubtedly draw your attention just as much on the inside as the outside is the Duomo. 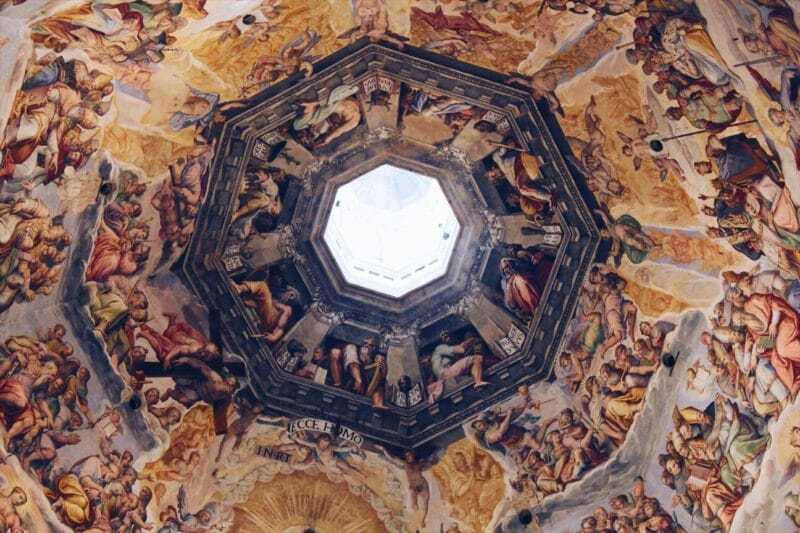 You can’t miss the incredible painting on the ceiling that was designed by Giorgio Vasari. 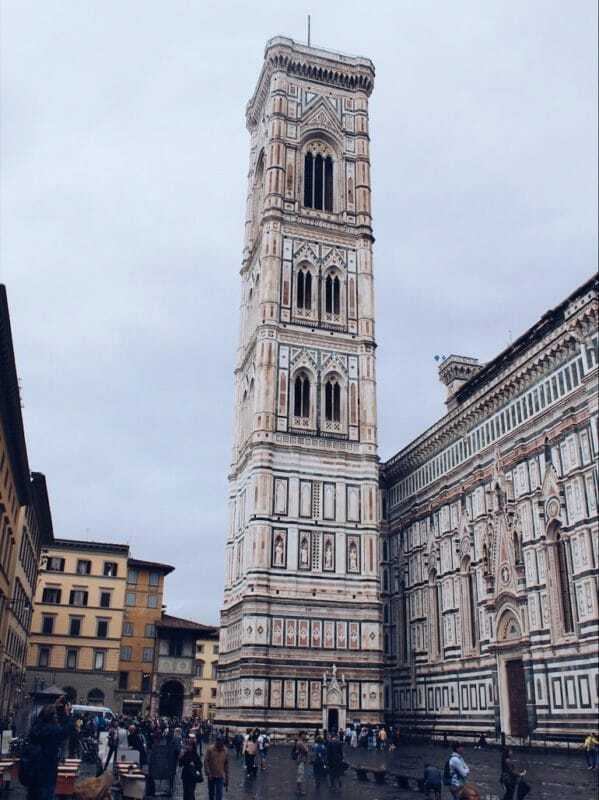 Built in the 14th Century and standing tall right next to the Cathedral, the bell tower of the Cathedral of Santa Maria del Fiore is called Giotto’s Campanile. With the same unmistakable marble colours and style, it is 82 metres high and has a total of 414 steps to climb to reach the top. Again, this was something we didn’t actually climb, but if you’re after that panoramic view of Florence then this is an alternative or an addition to the climb up the Duomo. It’s not that wide though, and with one staircase for everyone going both up and down I imagine it would get quite claustrophobic. Probably worth it for the view though. 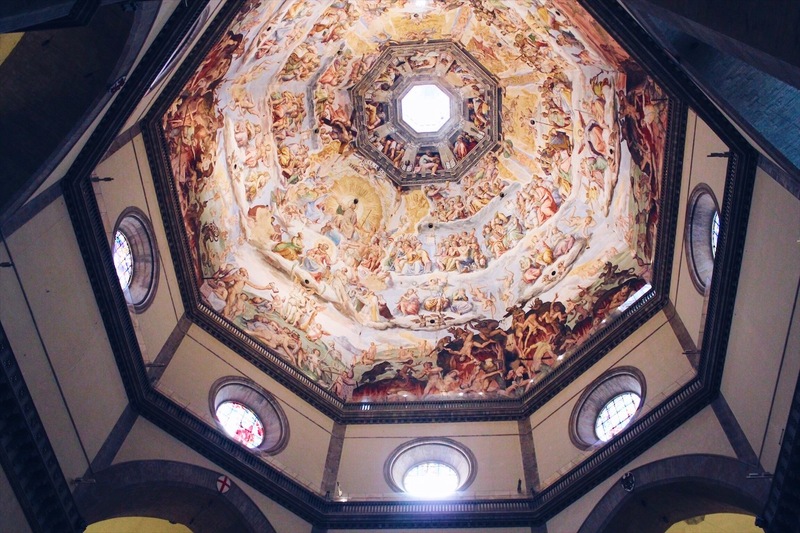 The Baptistry of San Giovanni is one of the oldest and most religious buildings in Florence. It’s so old that the actual date of it’s origin isn’t know. It is thought to have been built and developed over a Roman pagan temple as early as the 4th or 5th century. 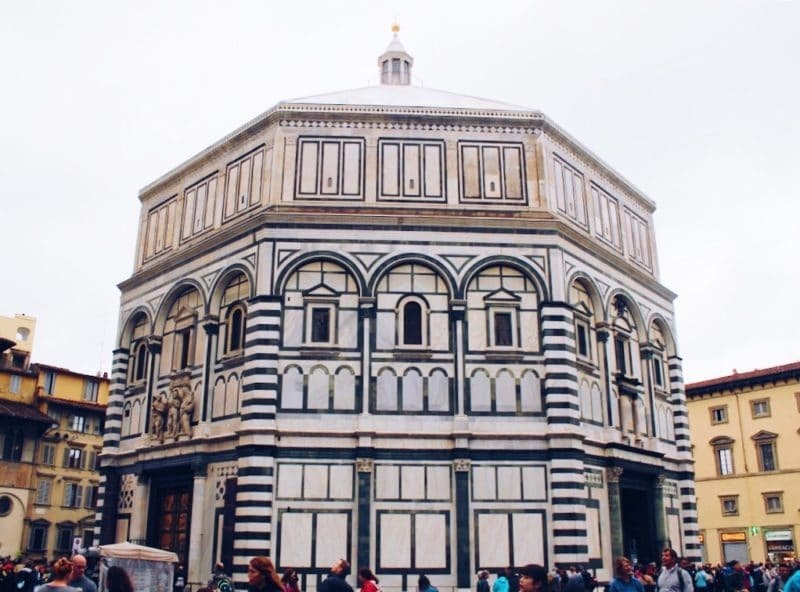 The Baptistery is named after the patron saint of Florence and is octagonal in shape. I think the queue for this was just as long as the queue for the cathedral itself, and the ancient gold doorways were a real point of interest for the crowds wanting photos. 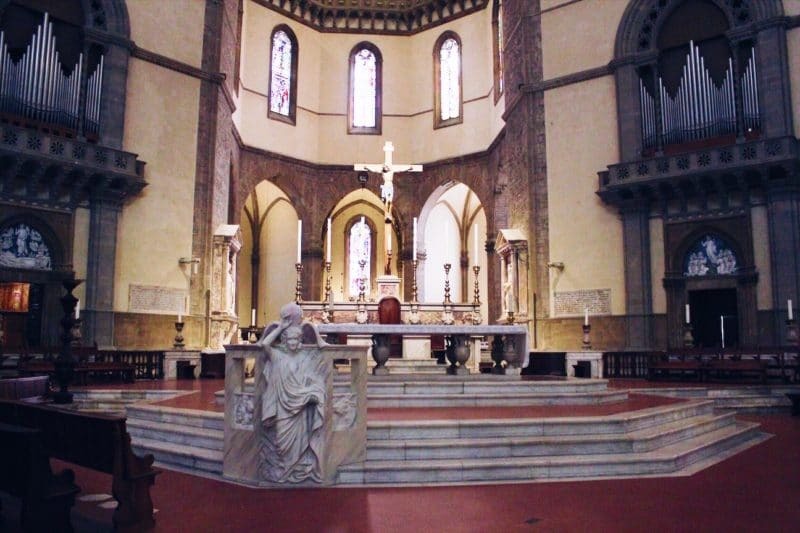 Children of Florence can still be baptised here on the first Sunday of every month. 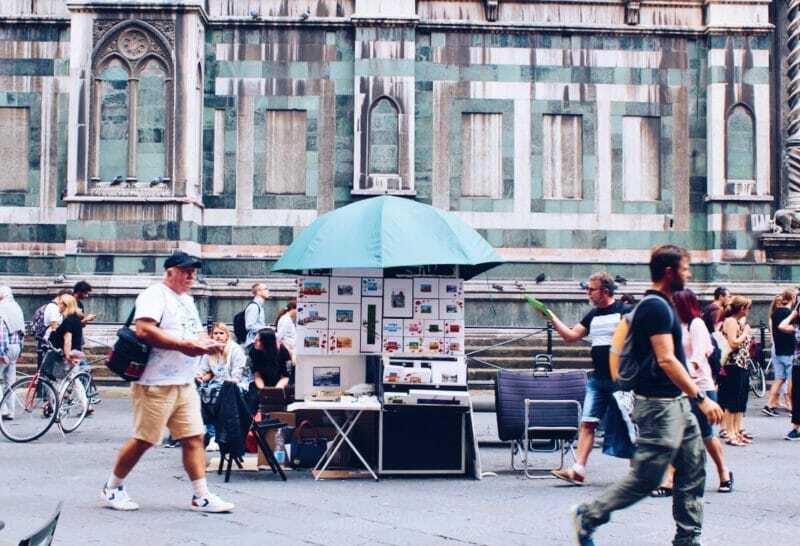 Admiring the incredible detail of all the religious architecture there is to be found in Piazza del Duomo will leave you ready for refreshment, especially if you’re climbing all those stairs and there are plenty of places around the edge of the Piazza that you can stop at. 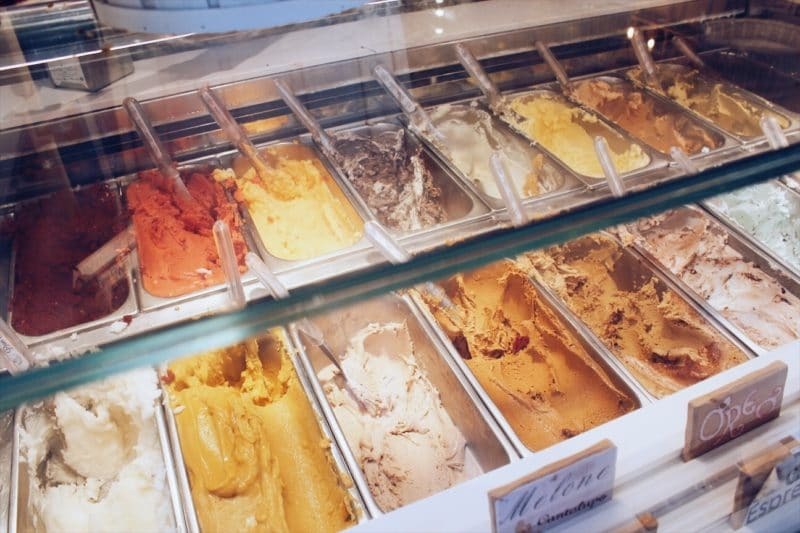 There were lots of gelateria’s, each with cabinets filled with mountains of thick Italian ice cream in all flavours. 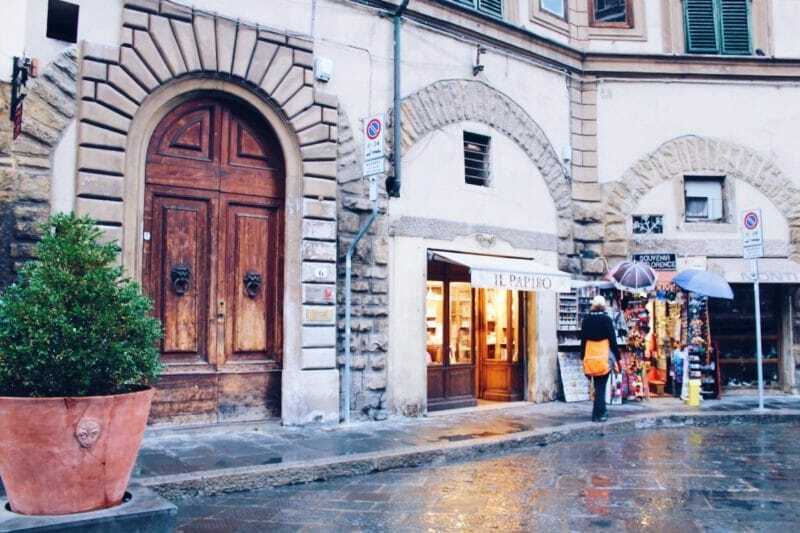 Each one has their own recipes and cute little tables outside, but my favourite was Don Nino’s parlour on the corner. 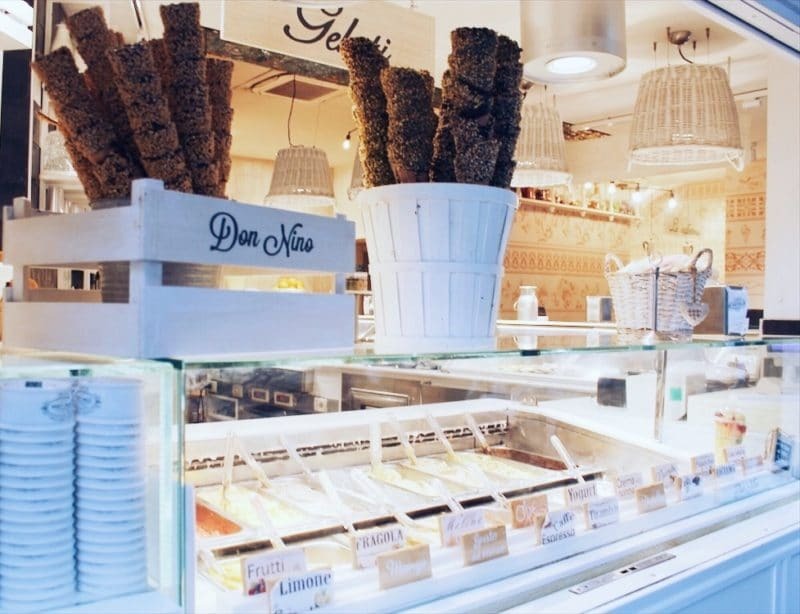 Don Nino have an all natural menu and their creations are made from traditional old recipes. They pride themselves on their craft and quality, and the parlour itself is like a throwback in time. A real treat and the only problem you will have is choosing which flavour to go for. 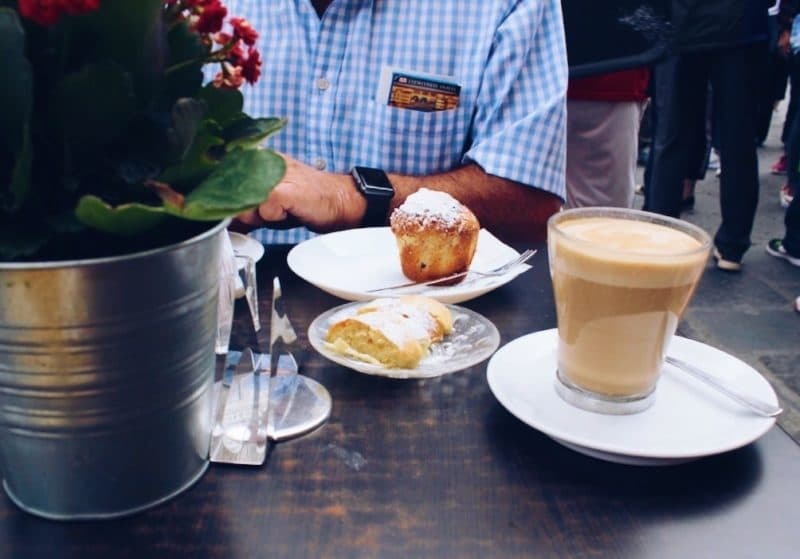 On another occasion we stopped for coffee and a crepe at L’Opera Caffe. Right next to the cathedral it was a great place for a close up view, with the Duomo in sight too, as well as being a good spot to admire the street artists work from afar. 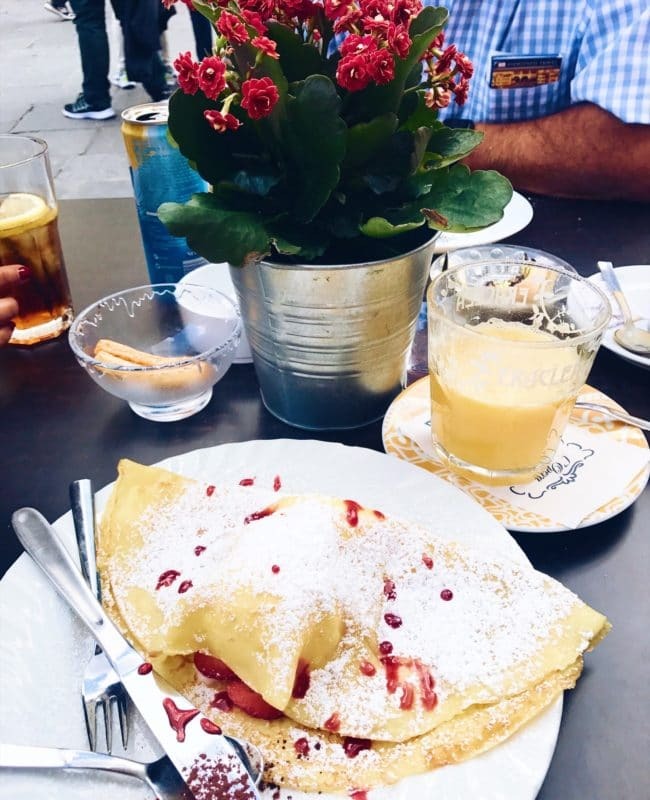 I had a strawberry and ice cream crepe and an Italian coffee and it was so good. I can’t remember how much the bill was, but it wasn’t extortionate despite the location. 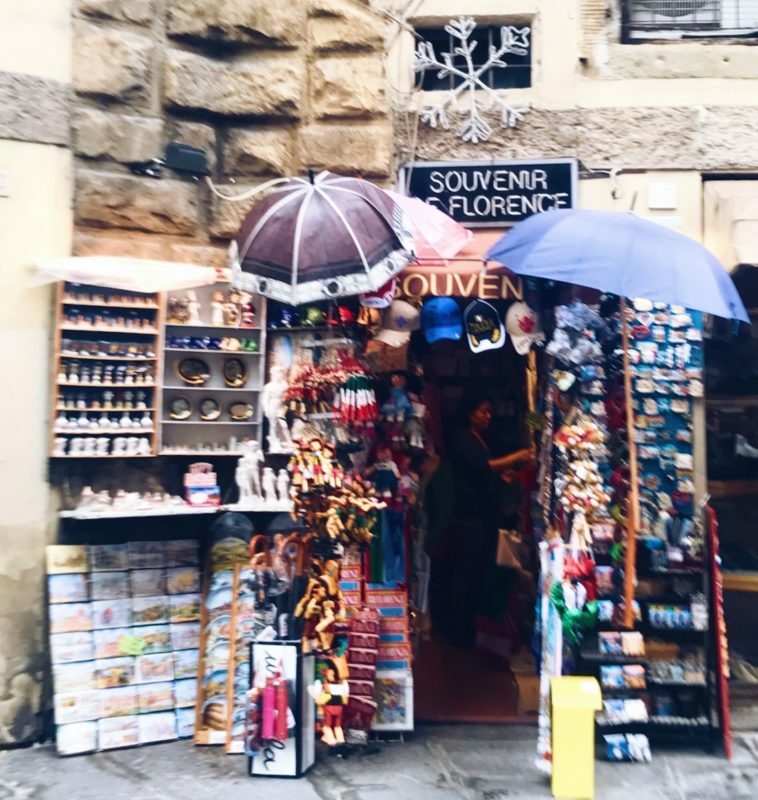 Piazza del Duomo is also a great place for some shopping, both in terms of touristy souvenir places, and real authentic goods. I have to say compared to most tourist hot spots in European cities, the tacky souvenir stands weren’t really very noticeable. There weren’t many at all, but there was this cute little shop owned by locals. 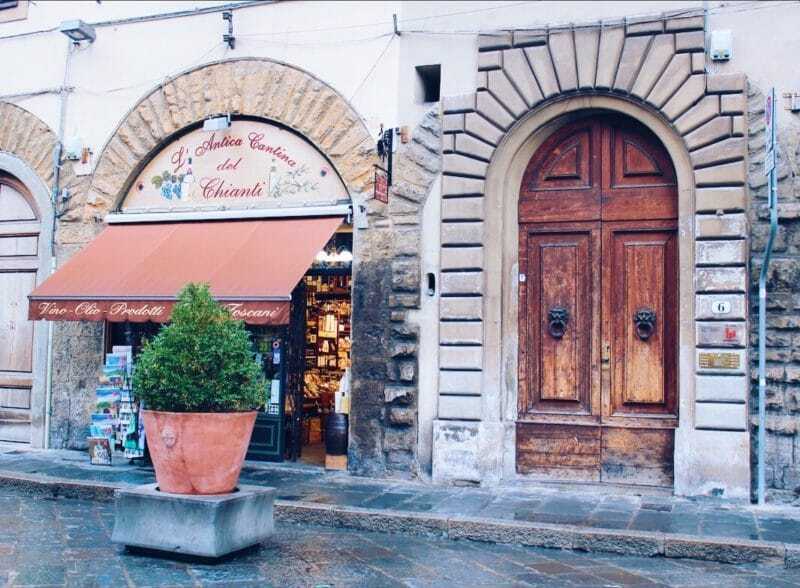 This shop however was amazing, L’Antica Cantina del Chianti. 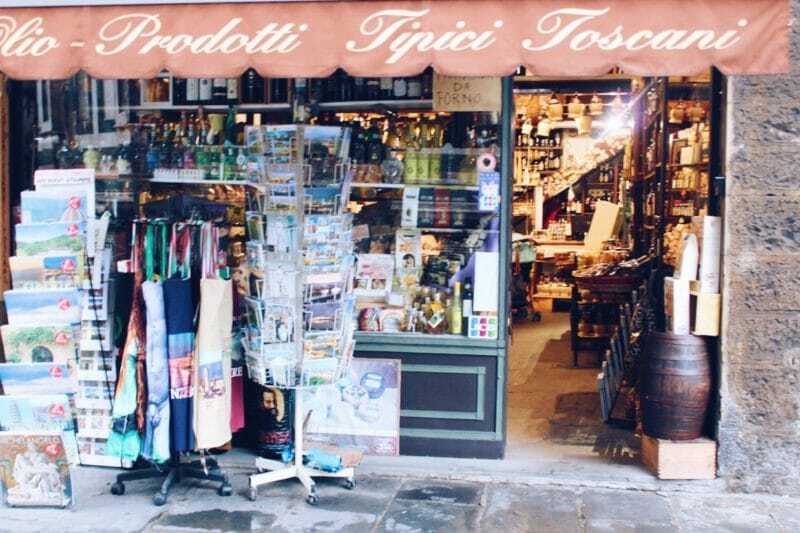 It sold Tuscan wines, as well as Italian wines from all over Italy, spices, oils and balsamic vinegars. It made my mouth water seeing it and knowing how many incredible Italian dishes would be cooked up in kitchens all over the city using their ingredients. 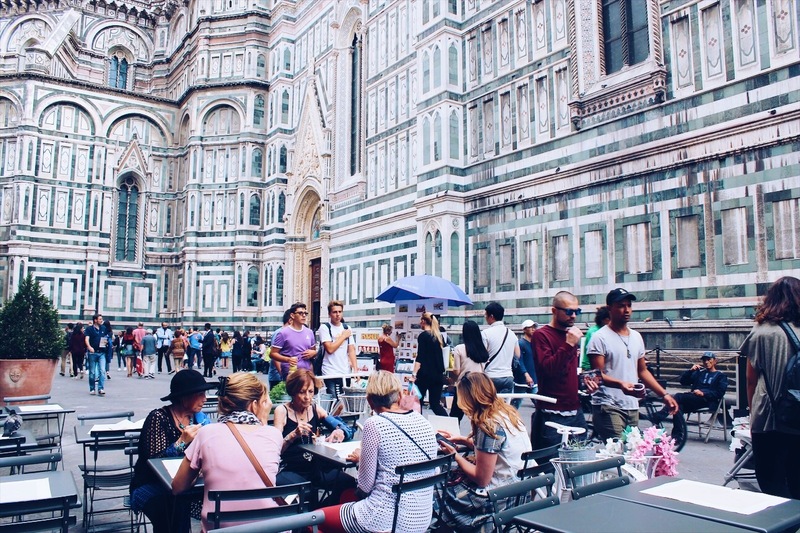 There’s so much to see and do around the Piazza del Duomo, and it’s beautiful from every angle. 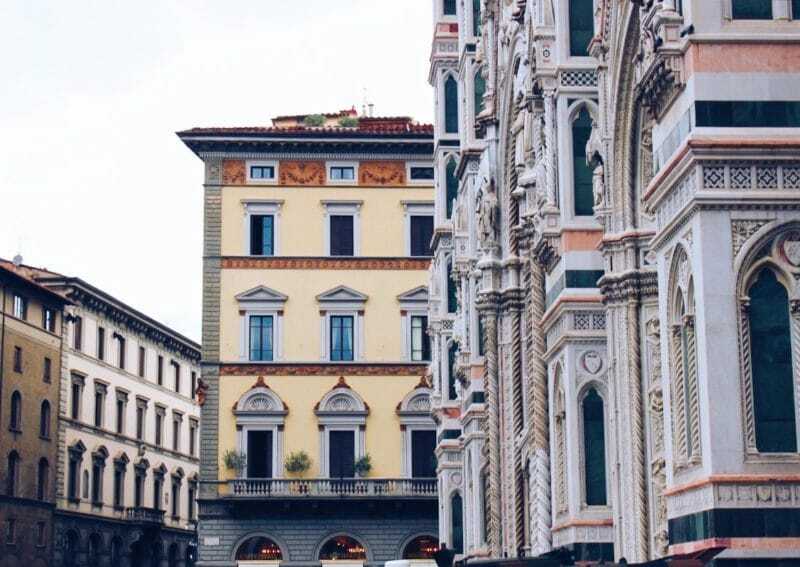 The typical Tuscan architecture is everywhere you look. 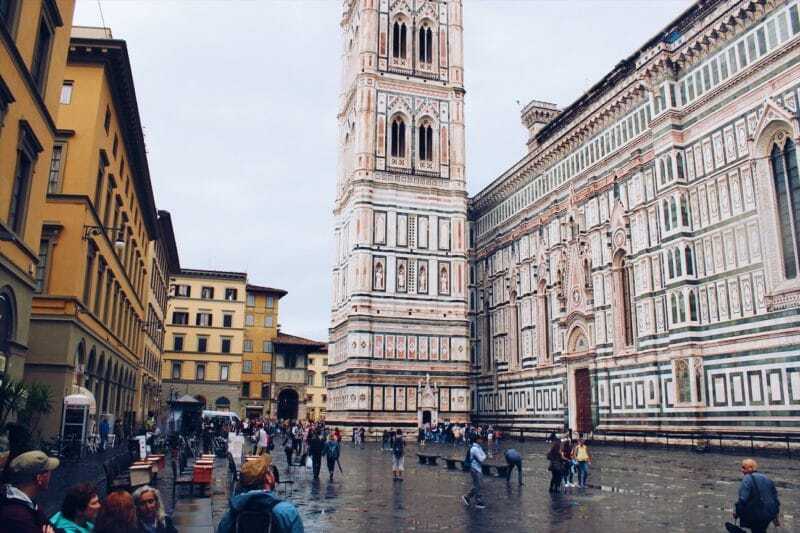 The tiny stone arch doorways and buildings around the square were so pretty, and if anything just made the cathedral, the baptistery and the bell tower appear even more grand in their marble splendour. 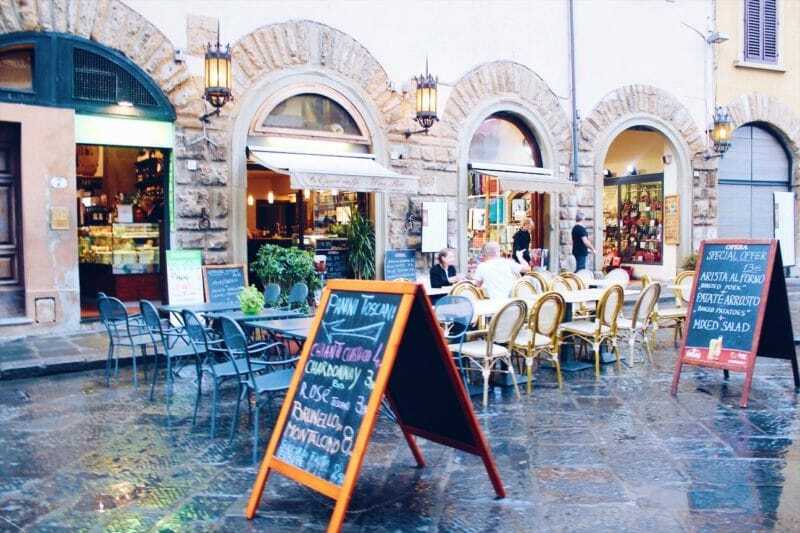 You could easily spend a day in this area of Florence alone, especially if you’re wanting to go up the Duomo and the bell tower, take a tour of all the religious buildings and enjoy some of the cafes nearby, so definitely plan this into your visit. I wish we had gone up the Duomo at very least, and I get the feeling that there’s so much more behind the scenes than it first appears. With all that history, artistic influence and years of development it’s definitely a place I’d keep going back to on any future visits. 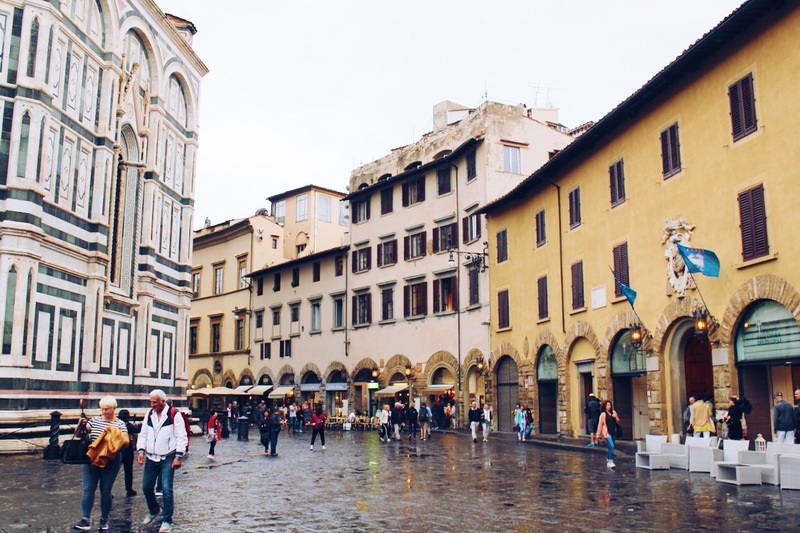 I spent a few days in Florence while travelling in Italy by rail and loved the city’s vibe. It’s so often the Uffizi that people focus upon, so nice to see you taking an in depth look at the heritage of the cathedral.